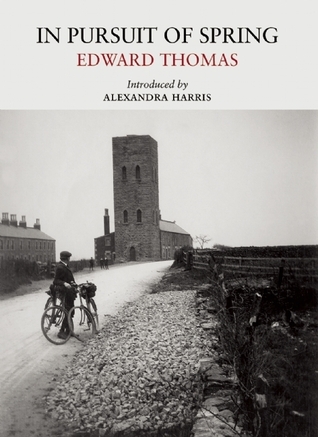 On March the 21st 1913, the poet Edward Thomas set off from Clapham with the intention of heading to Somerset in the West Country searching out the first signs of spring. His journey on his bike would take him through the lanes of Surrey, through my home town of Guildford, across the downs and past Winchester. He heads across a pre-Army controlled Salisbury Plain and onto Somerset where his journey ended. This is a heady blend of travel, natural history and architecture as well as the history of the places he visits on his ride across the country. He is a keen observer of the things that he sees as he travels through the countryside, spotting flowers just breaking through in the hedgerows, hearing the chatter of birds as he pedalled through a quiet lane and stopping to take in the views, which he relays details of in the account. Intertwined in the book are his thoughts on other writers who he recalls as he passes through areas associated by them. He also takes time to read the epitaphs of people that he never knew and discover stories of others that he comes across on his travels. The Plain assumes the character by which it is best known, that of a sublime, inhospitable wilderness. It makes us feel the age of the earth, the greatest of Time, Space and Nature; the littleness of man, even in an aeroplane, the fact that the earth does not belong to man, but man to earth. When Thomas cycled across the south of the UK looking for the first signs of spring, he saw a country that was at peace with itself. A year later that was all to change as war broke out over Europe and men rushed to sign up. Their drain of manpower from the countryside was to change the country forever. A lifelong pacifist he still felt an obligation to enlist for the Great War, which he did in 1915. Sadly his life was tragically taken far too early from us in 1917 in the Battle of Arras. This is the first of his that I have read, and oddly enough at the same time a poem of his was in another book I was reading, but it won’t be the last. He has a way with words in his descriptions that are quite evocative and in other parts, he can be quite matter of fact about what he is seeing around him. This edition includes several photographs from his collection as he cycled across the country and it adds a wonderful touch to the text. This sounds wonderful. I read Edward Thomas’ poetry at school and while I’m not big on poetry, his sense of place and connection with landscape made an impression and made me want to replicate it in my own writing, all these years later. A beautiful, lyrical writer. And there is an equally moving and beautiful memoir by his wife, whose name escapes me, called Under Storm’s Wing. I read that over thirty years ago, also when I was at school, our English teacher who was taking us for his poetry recommended it, and it has stayed with me. That’s when you know a writer has something isn’t it. I have never read any of his poetry until last week. Will be rectifying that soon.